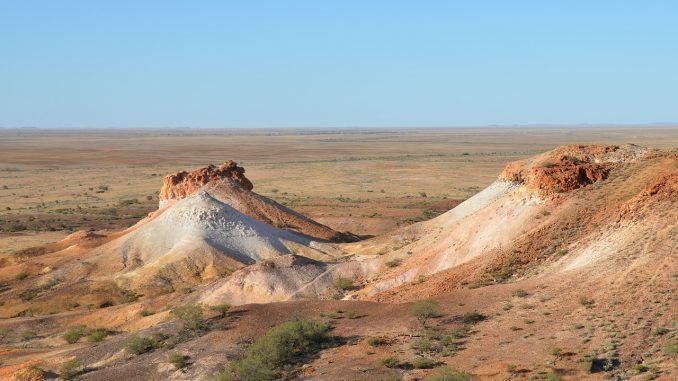 One of Outback South Australia’s best-kept secrets, The Breakaways Conservation Park, previously known as The Breakaways Reserve or just The Breakaways is a protected region in South Australia 21 miles north of Coober Pedy. Under the management of the Department of Environment, Water, and Natural Resources as well as the Antakirinja Matu-Yankunytjatjara Aboriginal Corporation, the park was named “The Breakaways” due to the appearance of it being broken away from higher surrounding grounds. Important to the Antakirinja Matuntjara Yankunytjatjara People the region is known locally as Umoona, which is a reference to a specific species of tree native to the region. Because of the arid, desert-like conditions, there are not a lot of trees and the Umoona is unique thrives in the cold nights and extremely hot days. The region is rich in Aboriginal as well as European history and is home to a wide variety of flaura and fauna. Tours from Coober Pedy are offered by several tour operators, and permits for self-guided tours are available for a small fee at the Tourist Information Center in the District Council Office on Hutchinson Street. Guided tours are recommended as the region is harsh and conditions can change quickly. Daytime temperatures can get as high as 113 °F (45 °C). All commercial filming or photography in the park may only be done under a special permit and with a cultural heritage guide present. More than 70 million years ago The Breakaways was an inland sea. The region is considered one of the world’s harshest environments.